If you live for Bengal Warriors vs Jaipur Pink Panthers matches, then Dream11 is the right place to be. Not only do they get the lowdown on all things about kabaddi, but you can also hone your fantasy kabaddi playing skills. Doing so, you can help yourself win real money while having the most fun gaming online. 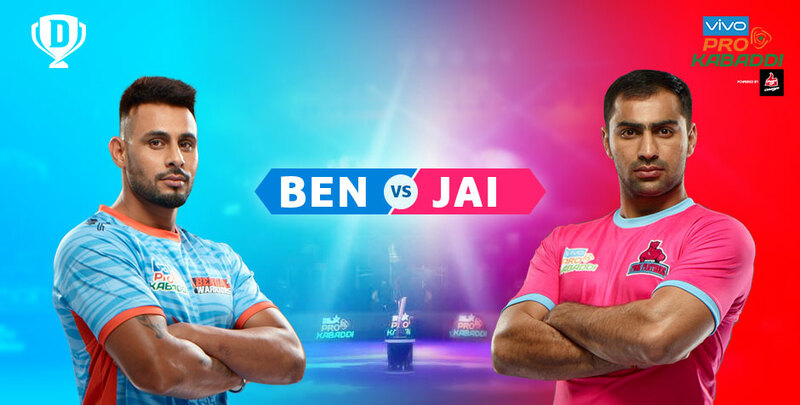 Show your love for kabaddi and keep track of Bengal Warriors vs Jaipur Pink Panthers scores while on the move with Dream11 – all it takes is a solid strategy and the will to win. Out of the six Bengal Warriors vs Jaipur Pink Panthers matches played till season 5 of the Pro Kabaddi League, the former has won four. The Jaipur Pink Panthers won the most matches in the first season of the Pro Kabaddi League, bagging a total of 12 victories out of the 16 matches they played. The Bengal Warriors had a good run in the third season of the series, with 9 wins out of the 16 matches they played. The Bengal Warriors vs Jaipur Pink Panthers rivalry is one of equals. While the former holds an overall all-season score of 2559 points, the latter has a total of 2641 points to their credit. The Bengal Warriors’ captain, Surjeet Singh, is one of the most formidable cover defenders. His strengths lie in blocking or dashing raiders and he holds a record of having the most number of High 5s in season 5 of the Pro Kabaddi League. All-rounder, Ran Singh of the Bengal Warriors is one of the top ten defenders in the Pro Kabaddi League in terms of his tackle points. He is best known for his blocking moves as it requires great strength and agility. Anup Kumar, captain of the Jaipur Pink Panthers scored the most number of points (169) in the first season of the Pro Kabaddi League. He has also won two gold medals for India in the Asian Games of 2010 and 2014. The Jaipur Pink Panthers’ Deepak Hooda is the third highest scorer of points as of the end of last season. He has 14 Super 10s, the fifth highest in the league. Create your dream squad on Dream11 and win big in various cash contests. Upskill and increase your knowledge base about kabaddi. Dream11 is also the Official Partner of the top sports leagues in the world such as the Hero CPL, Hero ISL and NBA, along with the Pro Kabbadi League. So, go ahead and hop on to the Dream11 bandwagon and make all your kabaddi dreams come true. Fantasy sports just doesn’t get better than this!